Harness replaces all of the wiring between the Holley gold box ignition, the Holley distributor, and the ignition coil. If you have a failed Holley gold box ignition system, you may want to change this simple plug and go harness to solve the problem. If you buy our brand new engine harness SP 12531 you will also need this gold box harness if your Scout is equipped with gold box ignition. Question: How can I tell if I have Holley gold box? Answer: If wires run from your distributor to a gold or silver box mounted to the firewall, and the distributor is a Holley (spark plug wires plug down into cap) you have the Holley gold box. if the distributor, wiring, and gold box conroller are all in working order, the gold box ignition system works great in Scout II trucks. This is NOT a box of wires that you struggle to make fit. 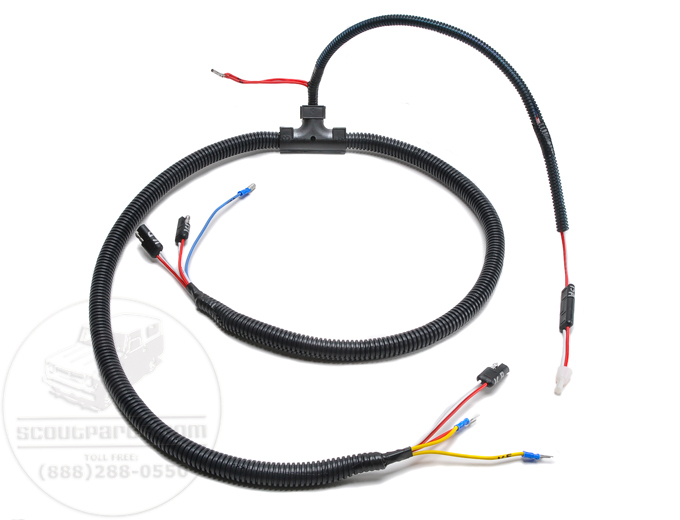 This is an exact reproduciton of the original complete harness that the IH factory made. You will have to reuse your fire wall connector. Built to suit. No refunds once ordered. You will have to reuse your plastic connector at the fire wall. If you like, you can send us yours and we will install the plastic connector on your harness.